It's the 17th Anniversary of Digimon Frontier! 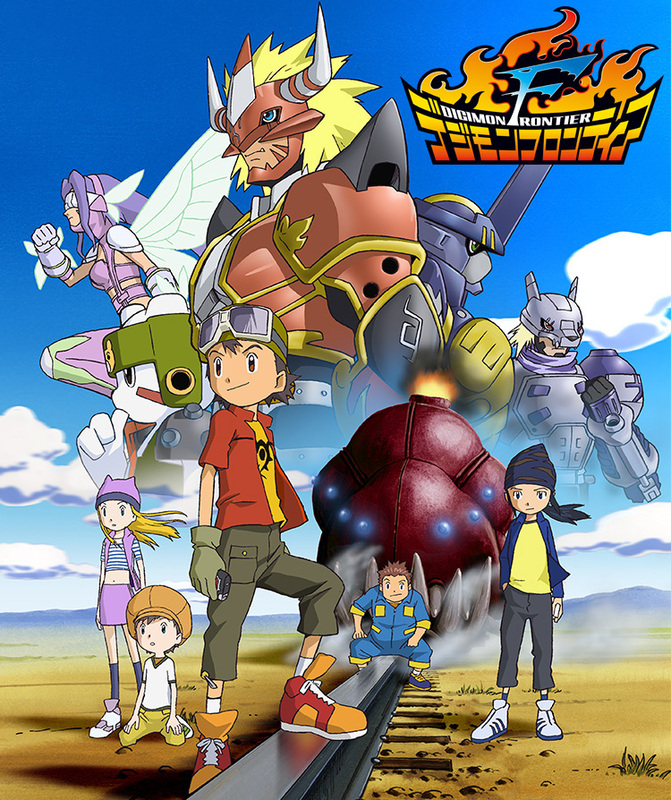 Digimon Frontier premiered on April 7th, 2002. Frontier was a show that both tried to go back to the anime roots of something akin to Adventure, but also trying numerous new things, including not having Digimon partners. The show went back to the lost/trapped in the digital world adventure, and 5 kids were joined by 2 Digimon for most of the series (with other characters joining later.) Frontier did a lot of interesting things, but it's always been questions how 'well' they did them, with a sticking point for many people being that the majority of the cast never seemed to have much, if anything to do, but the show overall is still a pretty amusing watch. Frontier was the end of the original run of the anime, but it did proudly make it thru it's product line (with some impressive releases near the end) and not burn the franchise out. Various Digimon products not only continued to come out after Frontier ended, but Frontier itself was popular enough that after it's ending, there were attempts in both the US and China to do continuations of Frontier (a cancelled manhua in China, and a new toyline in the US that would have story content.) The 2004/2005 'no affiliated show' toyline in the US used a modified version of Bandai's Digimon Frontier toyline logo and had a number of Frontier products in it. Frontier has been caught in the position in recent years of having relatively very little, likely because with interest being elsewhere it simply hasn't made sense to do much in the way of dedicated products. Frontier characters showed up in various 20th Anniversary brand products, recent V-Pets, and even appeared in recent games, but fans continue to hope for a fancy figure, updated D-Scanner, or something else. The newly released Frontier Blu-ray box, which included a new audio drama was a big item. A bit of a fun time for Frontier fans to share their thoughts on the show. A breakdown of Frontier's Blu-ray box is coming, like we do for many media releases, including last year's Digimon Tamers Blu-ray Box. If you are able to, donating or joining our Patreon can be a big help. We also did a breakdown of the Digimon the Movies box a few years ago. This contains the Frontier movie. I've come to like Frontier more since its conclusion. Don't get me wrong, there were plenty of bits I enjoyed (I don't hate watch, and I finished the damn thing =P) but back when it finished airing, that was sort of it for my original childhood fandom. I figured if it was going to be more oddball melodrama then I wasn't really into it (considering some of the character choices in Data Squad, I maybe made the right call...). But there's also a lot of cool stuff in there that overpowers the tropes. Mostly the Legendary Warrior themeology is a neat undercurrent and made for some really interesting designs, and bad guys too. The Lucemon arc is surprisingly satisfying and did a good job of ratcheting up the pacing and tension. But I still think the "no Digimon partners" choice was just a bad move. Then again, the traveling companions were kind of awful, so maybe that's for the best. Wow Frontier is almost of legal age :'D I'm gonna be totally honest, I have been always fond of Frontier since I first watched it as a kid, but for some reason lately it has grown up a lot on me. Re-watching the Digimon series as an adult gives you another vision on some aspects you didn't consider as a kid. The main Digimon premise amazes me as a whole, but I didn't realize back then how f*** up is to be dragged into a mysterious world in which you have literally nothing but yourself to keep up. Especially if you normally are the kind of person that feels socially alienated. The formula used in most Digimon anime series (expect maybe Xros Wars which works a little bit different) is that a human meets a Digimon that will fight to the death to protect him/her and that makes him/her grow as a human, and probably will fix his/her issues just like that. Which I adore in fact and it works, but this different formula in which the guys are helpless at the beginning and need to realize that only themselves will struggle for their future it's just...beautiful and realistic in some sort of way. That's probably why nowadays I feel more attached to Frontier than proably ever. By the way, next big anime première is Xros Wars in July, isn't it? I strongly recall the hoops I had to jump through just to get in most of the season and I still missed the final episode and left myself on a cliffhanger until Youtube became useable half a decade later. Lets face it. By the time Frontier aired in North America the networks were getting tired of another Digimon season, and this one was even harder to sell with a total lack of character exclusive toys. The spirit digivolving figures and digivices were great but compared to previous seasons there was barely even anything that they could base a commercial on. To memory there was the D-tector commercial and the revamped trading cards and that was it. Only now that we're all older and we can look at Frontier and have a nostalgia trip have I seen more people talk about how much they liked what was otherwise one of the quirkiest seasons of the series. As I recall Disney even got fined in regards to Power Rangers early on in their ownership because they were that unfamiliar with certain rules and statutes for throwing in those kinds of commercials on shows. The Frontier toyline doing well is part of why Bandai came oddly close to continuing the franchise in a toyline/product only story. It's nice to see this. While the Black Sheepmon of the franchise, it had a lot of fun points. My best friend was basically JP until he decided to get better. Then I have a favorite character in the series too. But my reasons are much dumber then his. But really, this season could have been better but for what it is, it's a good season.